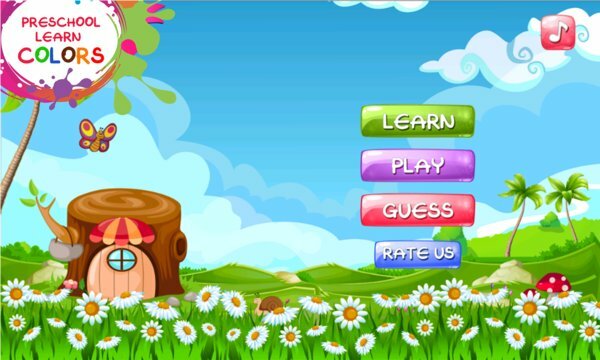 The game will teach your child nine various colors: blue, brown, pink, gray, green, violet, orange, green and yellow. Each color comes with three beautiful pictures matching that shade. * Learn - In learn activity, you'll be showed a paint brush of certain color, along with its name being pronounced. Then, three illustrative pictures are displayed to match the color. For example, Orange, Carrots, and Pumpkin illustrate the orange color. When the three pictures appear on the screen, the names of the objects, fruits or animals in them are also pronounced. Tap any of the pictures to hear its pronunciation again. * Play - The “Play” activity tests the color recognition skills of your child and to revise the names of the colors. The child matches each of the three painted hats to the frame of similar color. If the pieces are placed together correctly, the child will be congratulated on the great job. * Guess - The “Guess” activity checks your child’s ability to correlate the colors with different objects. 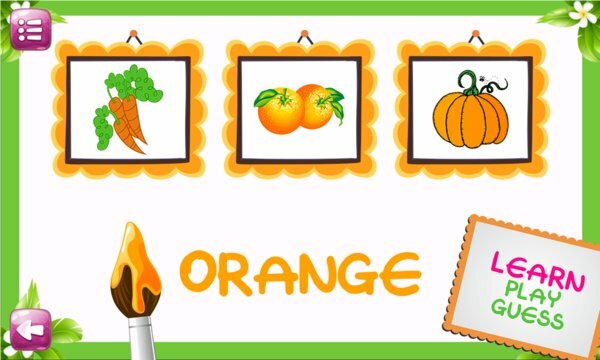 “Preschool learning colors” is a free game, which can be fascinating not only for preschoolers, but for school children as well. Have a great time playing together with your children.